The last day. The end of the goal. Padrón and Santiago are separated by almost 25 kilometres of Camino. The day, once again, is structured around the N-550 road, involves a continuous ascent until reaching O Milladoiro. The route passes a multitude of small villages within the councils of Padrón, Rois, Teo, Ames and Santiago. The entrance to the old town is via the gateway of Faxeira and the street of Franco, the traditional area of tapas bar. The stage Pilgrims abandon Padrón via calle de Dolores, passing very close to the bus station, until reaching the N-550. Travelling through the village of Pazos, afterwards a roundabout and the Hotel Scala are reached, with a pilgrim menu and vending machines at the entrance. In the adjacent building, the restaurant asador Pazo is also situated, serving excellent meat of the highest quality. On continuing the Camino walkers pass the chargrill restaurant Fogar de Breogán. At last a yellow arrow leads walkers away from the road and from this point pilgrims can enjoy one of the most pleasant stretches of the day, through the narrow streets of tiny countryside villages. Rúa, Rueiro, Cambelas, Anteportas and Vilar, from which the route returns to the railway line as a prelude to the road. Not only do pilgrims have to cross the road but they also have to share it with heavy traffic and without the aid of a pavement. Extreme caution should be taken. Less than half a kilometre away walkers will find the location of A Escravitude, with bars, accommodation and a small shop. After following the milestones and yellow arrows pilgrims once again encounter the railway line, which they have to cross again at the level crossing, this time without barriers. Walkers then go through the business park of A Picaraña via the N-550, along the left hand side of the road, here they will find the guesthouse/bar/restaurant called Glorioso and a Mexican bar/restaurant. From here walkers pass a service station and, now in ascent, should take a turn off to the left, in the direction of Faramello (a small location in the council of Rois) until reaching Teo, its albergue is well signposted, 200 metres from the Camino). The Rural Tourist House Parada de Franco has an additional restaurant and offers a menu of the day priced at 12 euros. After crossing the railway line and taking the Camino del Río Tinto to the village of Pedreira, the route encounters a connection with the motorway that has obliterated the Jacobean Route. Aside from the extra distance, travellers are forced to put themselves in risk until reaching the other side. You can never be too careful! 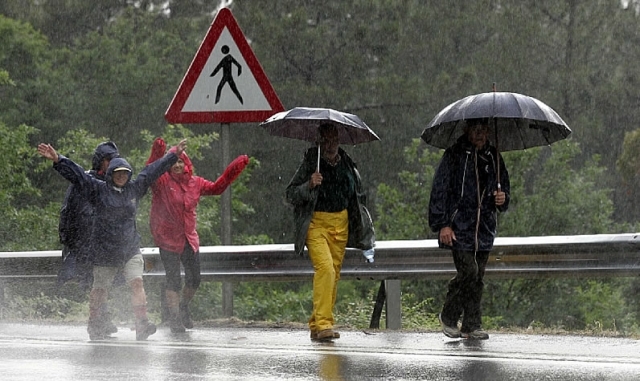 Apart from this pitfall, via local asphalt roads in good condition and almost without traffic, walkers reach the area of A Grela (in the council of Ames) and, after a slight but continuous ascent on a busier road, pilgrims turn left at the junction to reach Milladoiro, a quiet town on the outskirts of Santiago. Having bordered around the commercial estate, where they will find the cafe bar of the central culture, pilgrims enter again and, for the last time, a forest before arriving in Santiago. After crossing the River Sar via a small bridge and a complicated roundabout, they face a great ascent in front of the central hospital of Galicia. The arrows provide directions of the Camino for pilgrims until reaching the neighbourhood of A Choupana, which they exit on the street of Rosalía de Castro. From here they only have to reach the historic centre of Santiago. 1 reviews Distance to Santiago: 24 km. 1 reviews Distance to Santiago: 18 km. 1 reviews Distance to Santiago: 6 km.